Technology and services in education. We are changing from being a textbook publisher to a broad-based supplier of education technology and services as well as curriculum materials. These are significant changes and are shaping how we think about the structure of our business and the types of people we employ. People development. Making sure that we offer the right development opportunities for all our people. Understanding the workforce of the future. As the shape of the business changes, so do our future skills needs. This means that some functions and roles which we currently have will no longer be needed, while new jobs and structures will emerge which we may not yet have considered. Data and analytics. As we grow organically and by acquisition, we need to be able to understand how we are changing both through hard data and by reviewing what people tell us about how we are doing. Collaboration and engagement. Having an efficient way for our people to communicate is important to our business success by helping us to work differently and more efficiently. Diversity and inclusion. As we internationalise and grow, so do the people that work for us. Wellbeing. We care deeply about the wellbeing of all employees and their families and we look to create opportunities for everyone to take steps toward healthier living. Health and safety. A duty we share with all organisations is to offer a safe and healthy workplace for the people that work for us. We need to be able to identify and fill skills gaps while also ensuring that all our people have the technical, personal, management and leadership skills they need to carry out their roles. Everyone has at least an annual appraisal and development review with their manager to agree objectives for the coming year. We offer a diverse and comprehensive range of learning and development opportunities around the world. For our future leaders, we ensure each individual has a development action plan to help them make progress in their careers. 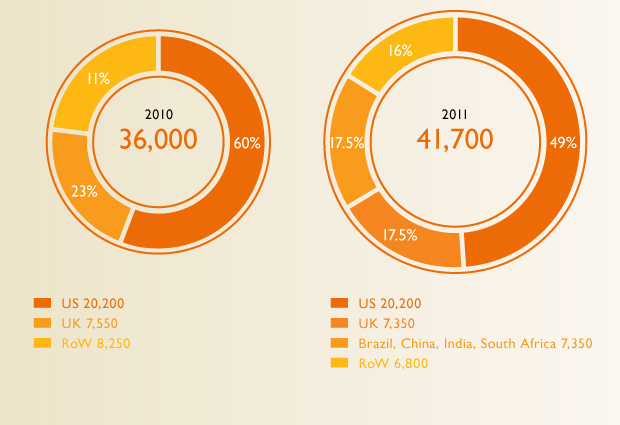 In 2011, we started a review of learning and development across Pearson. We set up a council representing learning and development professionals from the Pearson businesses around the world to review our current approach and make recommendations for the future. The council has developed a business plan to establish the Pearson Academy. Pearson Academy will make learning available to everyone globally in an appealing and engaging way. It is designed to develop better prepared and better skilled people for the future and to put learning and development at the core of people's working experience. Pearson Academy is a global community of existing learning groups and alignment of people-related resources and activities across the company. Through Pearson Academy, we will develop our people to lead the world in learning by encouraging them to be always learning in all ways. As a global business, we need people to want and to be able to move around the world to fill the leadership needs of growing businesses. Global management experience rounds out the professional development of key individuals as well as giving local teams access to our global talent pool. In 2010, the International Mobility Team was formed with a remit to take the pain out of mobility and help our key talent develop on a global stage. Facilitating the immigration and relocation of a manager from Pearson Australia who applied, and was selected, for a local role in Beijing, China for Wall Street English. Our businesses need access to the right people with the right skills at the right time in the right place. This sounds relatively easy, but we operate globally in fast-changing, hard to predict, often digital-led markets. Effective scenario planning, supply and demand forecasting and implementation of key people strategies are critically important to mitigate risk in realising our business strategy. 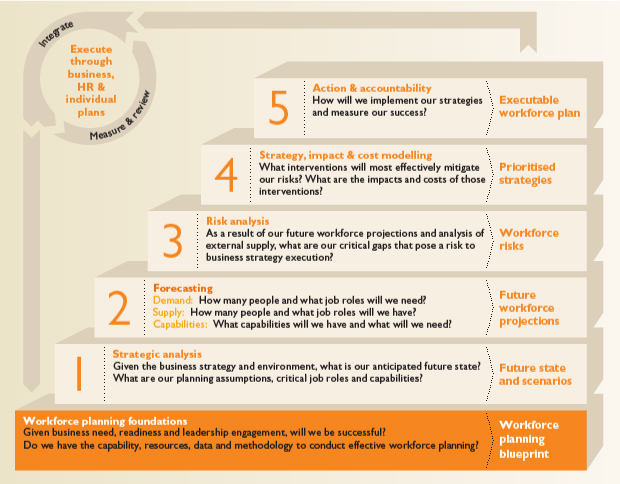 To help with that process, we have adopted a workforce planning approach that helps businesses align their business strategies with people strategies, including identifying workforce capacity, capability, and flexibility. Changing business models can lead to a need to restructure and integrate teams, and to a reduction in roles. Where possible, we aim to either offer redeployment to other areas of the business or reduce numbers through natural attrition. This is not always possible, so we offer voluntary severance or make less use of contractors where that is relevant. Compulsory redundancies are always a last resort. Whatever changes we make, we do so in light of the company values to be brave, imaginative and decent. This means being open with our people about the changes we have to make, helping those affected to adjust and ensuring that we are sensitive to the needs of each individual. Operating businesses currently track people metrics. We have introduced a single system to track all US people data regardless of operating business using common definitions. Data is reported and analysed by operating businesses and supports workforce planning, benchmarking and analytics. We have reviewed our approach to data collection and plan to extend the scope of the people data currently available through this consolidated system to include data from the major businesses in the UK, Canada and India. It is expected that these populations will add approximately 9,000 additional people to the current database of on average 20,000 regular employees. This initiative has begun and the first phase should be completed during 2012. We have launched a digital space for Pearson people to find each other, to come together to share ideas, expertise and information, and to collaborate. In January 2011, we launched Neo, our global collaboration platform. Just one year later, over 33,000 of our people are using Neo to find each other and work together and so far we've had more than 30,000 conversations and created 7,500 groups. In a poll of users, 64% of employees said Neo had improved their ability to find and connect with people across Pearson. Our CEO and senior leaders recently used Neo to share our annual results with employees, generating hundreds of comments. Neo won the 'Engage Employees' award from Jive in 2011. We were included in the Corporate Equality Index Human Rights Campaign's (HRC) Best Places to Work. The index recognises inclusive workplaces for lesbian, gay, bisexual and transgender employees. People are our most important asset at Pearson. We strive to do the right thing in all that we do, especially when it comes to taking care of our employees. By encouraging our employees to take care of themselves, we can feel confident that Pearson's wellbeing, as a company and a collection of talented people, will continue to stay strong. The health and safety of our people is of overriding concern to us. We believe that good safety and health practices in the workplace are a basic building block of a responsible approach. Pearson people work in offices and in data, contact and distribution centres. We adopt a risk-based approach to health and safety paying particular attention to facilities such as distribution centres with relatively higher risk of incidents. Our US business is implementing a comprehensive management system for injury prevention and employee protection. In 2011, we were deeply saddened by the death of one of our colleagues while on a business trip to Medan, Indonesia where he was due to present a series of teacher training workshops. Our colleague arrived at Polonia International Airport, Medanin the late evening of October 19, 2011 and on arrival, opted to secure his own transportation to his hotel. A short distance from the airport, he was stabbed in a botched robbery attempt and died in hospital later that night. The Pearson team worked with our colleague's family, the local authorities and relevant consulate inIndonesiato ensure the speedy repatriation of his body. The alleged perpetrators are currently awaiting trial inIndonesia. As we do with all incidents, we are learning from this tragic event to help strengthen our travel policy to ensure it is properly defined and addresses issues such as common sense travel safety and security reminders.